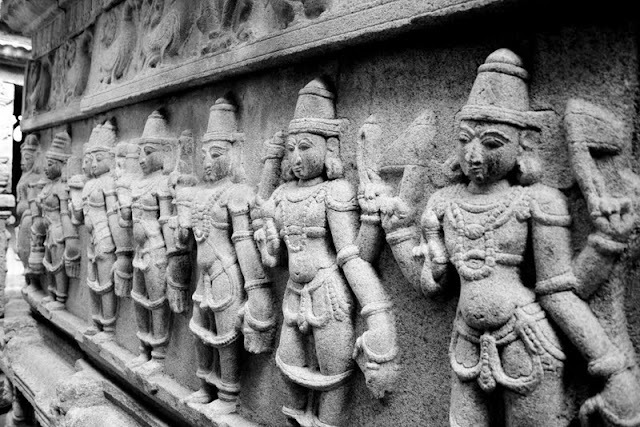 This Saturday morning, we packed up some stuff and headed out for Bhoganandishwara temple. 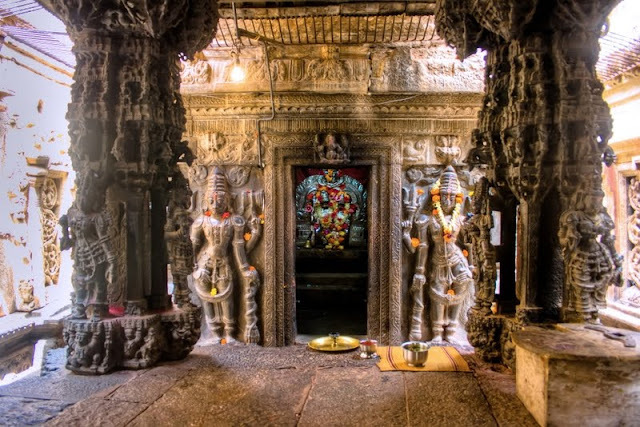 The temple is located in the foothills of a famous tourist destination "Nandi Hills" at the outskirts of bangalore City. 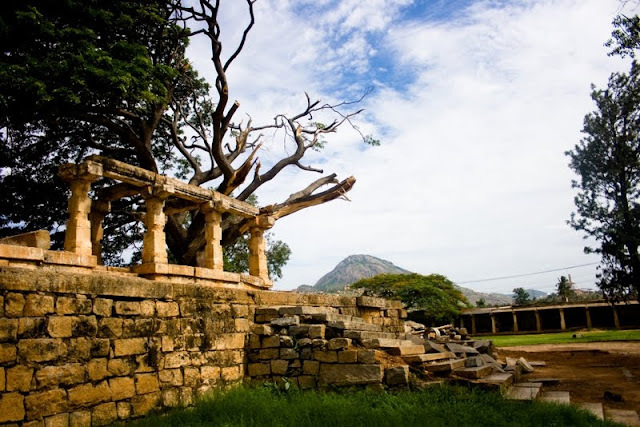 As you passover the bangalore international airport and stretch over devanhalli, this temple lies in the serene and calm surrounding of Nandi village. Starting early was a good option and also exciting was the fact that our 3.5 months old daughter was to make her first outing with us this day. Hence we were stacked with anxiety and also thrilled about the same. We could only start by 7:30 am, due to all household chores and managed to reached the temple by 9 am. 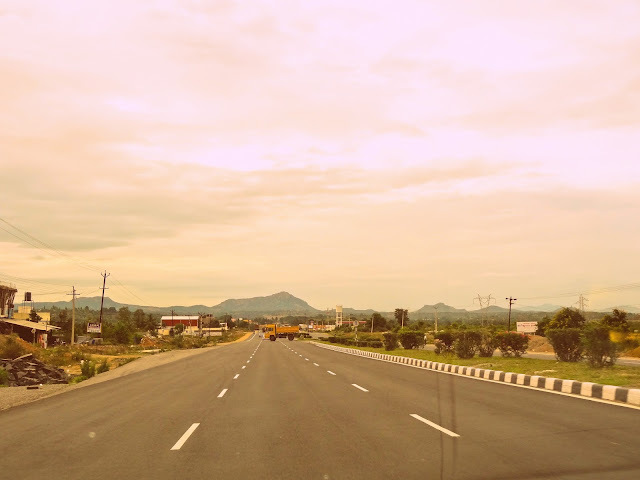 From the main road, once you take left for Nandi hills, you need to continue on the same road, till you reach a T-junction where lot of small hotels and shops are located. It should not be a problem identifying this T-junction since thats the only one in the whole area. 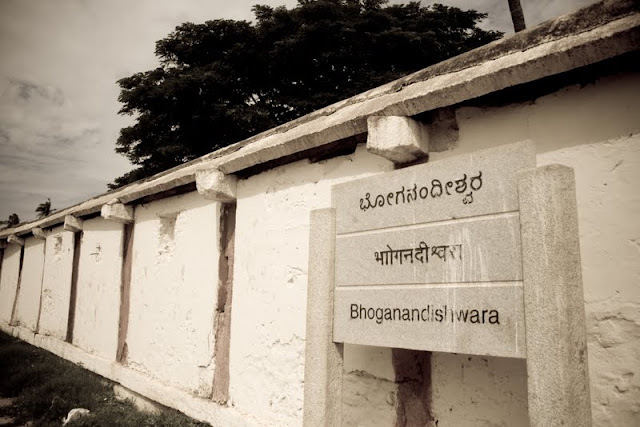 If you take left from here, you would head towards Nandi Hills but for the bhoganandishwara temple you have to take right. The temple is approx 5-6 kms from here.The roads are great and luckily the weather was great on this day as well. It had been raining and have been overcast in bangalore for almost 2 weeks now, and i was almost sure of getting some washed out photos, but the sunny morning gave great hopes. The temple entrance is a huge gate which gave us initial glimpse of the huge lawn area to both the side. The walls corroded, with lush grass on one side with beautifully maintained ferns at the corners. This looks like an ideal setting for shooting a documentary. Lot of maintenance work seems to be happening here, which is encouraging enough. We move in taking shots around and reading about the place. At the entrance of the temple, there was a beautiful set of huge circular stone wheels on one side and a cart of wood being prepared on the others. There are ample trees though the campus and the wind was blowing past the leaves making beautiful sound. We could hear the birds chirping and amazingly, your hearing abilities start to catch these sweet sounds, whenever you break your city life routine and come out to a countryside like this. We were already feeling very relaxed and the environment was adding to it. Though the time was not very early for a saturday morning, there were no visitors here. We were the first ones to enter the temple. A security gaurd greeted us on the main gate and asked us to do the darshanas. Buying the tickets, we took some photos and then finished darshans of lord shiva and other deities of the temple. The first impression was of a very beautiful, extremely clean temple which is a marvel in the history books. 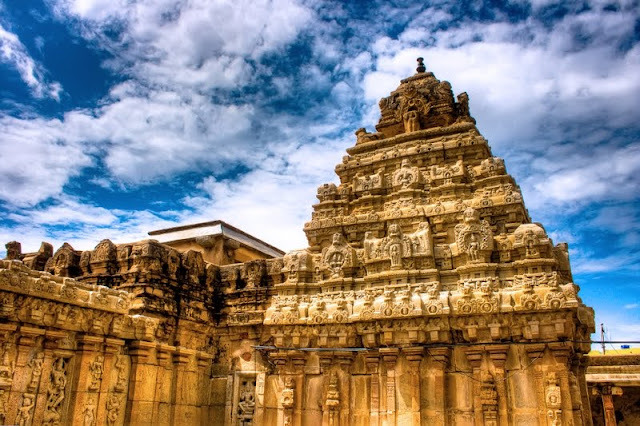 Bhoginandishwara temple stands tall for more than 1000 years now and has amazingly rich cultural connect. You can read lot more stuff about this temple online or the priests should be able to give you insight. We thoroughly enjoyed small conversations with them. 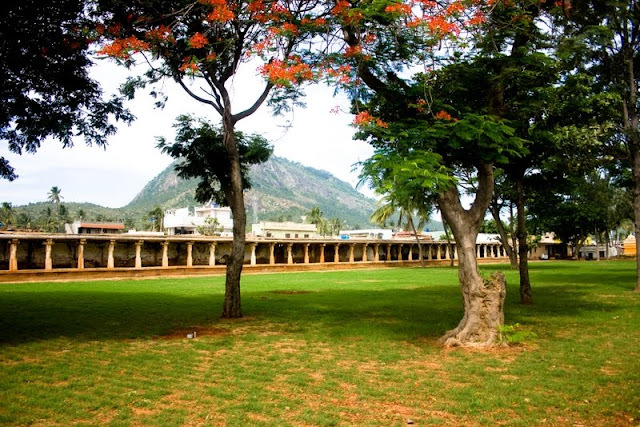 Built in dravidian style, it has a set of mantapas, with each having history tied to them. 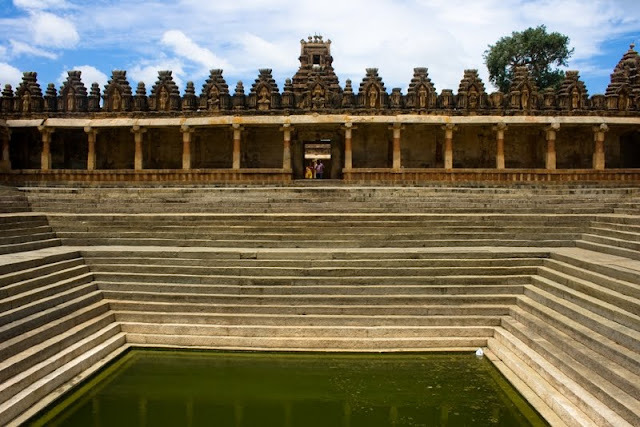 The most famous being the "Vasantha Mantapa", which if is to be believed, is where Shiva and parvathi got married. 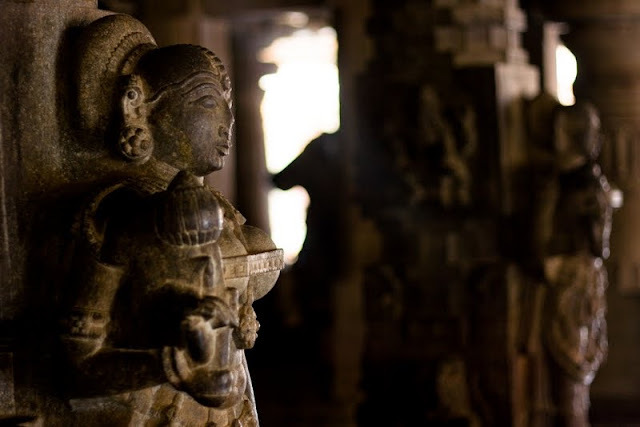 The sanctum of the temple which is exactly in the middle, comes from the chola dynasty and is more than 1000 years old. 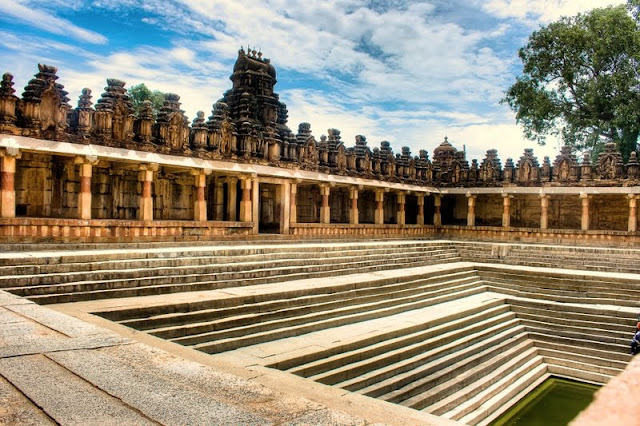 The gopuras, as you would notice were built by the vijayanagara empire. 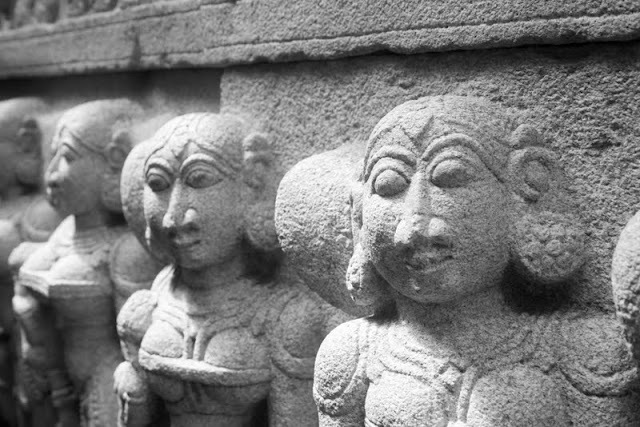 The most interesting part was the maintenance of the place, the silence around and the carvings in the stones. The combination of these three factors was just intoxicating. We moved around and then came across an opening through which we entered into the pond area. this is a huge pond with three entrances and chautaris on all its side. The view was beautiful here and we spent sometime here. Finally, we came out, spent some moments in the outside lawn and then started back to bangalore. Here are some facts/details about this trip and leaving you with some photos. Do share your experiences if you have been here or do write to me if you need more details on visiting this place. An exciting day all in all. Road Condition: great Roads through out the journey. 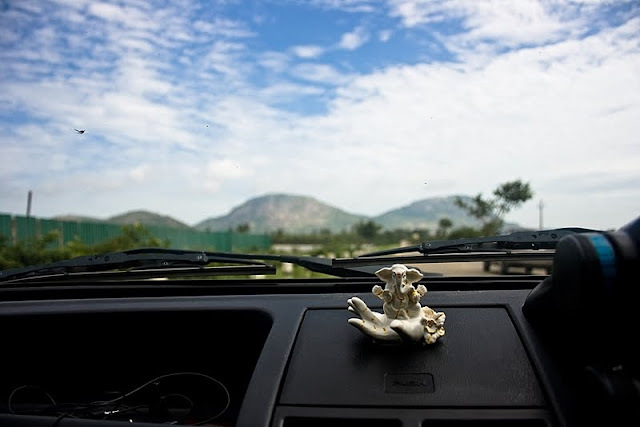 Direction: Catch the nandi hills route, from the T-junction take right and 5-6 kms thereafter is the temple. No videography or stand photography(using tripods/monopads) is allowed. 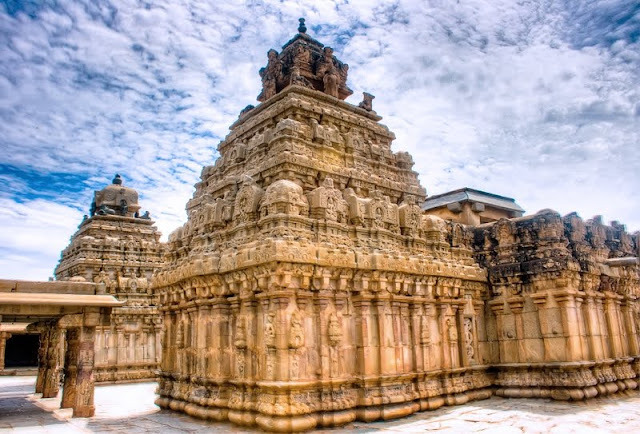 If starting early you should club visit to this temple with nandi hills trip. In case you stop in the village, the kids/some people are in habit of chasing you and asking for some money. I personally don't think they should be entertained since this just sets a very wrong trend for others as well.